Vape pens like those in our store have a number of different options – like type of material they vape, strength of the battery, type of heating element, button or buttonless activation, and more. Here we help you recognize what to look for when shopping for a vape pen and recommend our best vapes for first time vapers, but first, let’s look at the basics of vaping. Vaporizers like vape pens work by heating your vape material – such as dry flower, wax, oil, and eliquid – to their vaporization points, but below their combustion points, to produce a clean, flavorful vapor that can be inhaled, absorbing the active ingredients from the vapor through your lungs. Since it doesn’t burn your vape material, vaping helps users avoid the toxins and carcinogens associated with smoking, reducing smoking’s negative health concerns. There is also no foul smoke smell to linger on clothing, hair, and furniture. Instead, vape pens create a clean vapor with a mild scent that dissipates quickly. Your battery will connect to the vape pen’s atomizer or heating element. The atomizer is responsible for converting the vape pen’s electrical power from the battery into heat. This allows you to heat your vape material, whether it is dry flower, vape juice, or other botanical oil extracts. Finally, vape pens have a section that holds your vape material. In some cases, especially in disposable vapes, this is called the cartridge or sometimes pod. Your vape cartridge will often also contain the atomizer as a single unit. While this is common in disposable vape cartridges, it is also possible to buy this style of cartridge in a refillable model. Other times, the atomizer will be a separate piece that attaches to the vape pen’s tank or chamber (the piece that holds your vape material). Once your vape pen parts are assembled and filled with your vape material, you are ready to get started. There are two ways vape pens are activated. Some pens are what is called “autodraw”. This means that all you need to do is take a draw or puff and the pen will heat up creating inhalable vapor. The other style is button activated, meaning you need to hold down a button to activate your pen’s heating element. In either case, you will inhale the vapor from the vape pen’s mouthpiece. Although many beginners prefer autodraw because it removes a step and makes it easier to take quick puffs, it comes down to a matter of preference when choosing autodraw versus button-activated. Autodraw pens also won’t be accidently turned on when kept in a pocket or purse like a button-activated pen might. When selecting your first vaporizer, you will have to choose between a larger tabletop vaporizer and more portable vape pens. Many beginners choose vape pens and other portable vapes for reasons like their small size, lower cost, and ease of use. The first choice for many consumers looking for a straight forward, ultraportable, and easy to use oil and eliquid vape pen, the KandyPens Slim is a common starter vape for beginners. The sleek battery is the same diameter as a standard ink pen. Buttonless autodraw activation makes use incredibly easy – just pull air in through the mouthpiece and inhale the vapor. There is no button to fumble with. KandyPens Slim uses the near industry standard 510 threading to connect to the included atomizer cartridge, which can be filled with your choice of vape oil or eliquid. 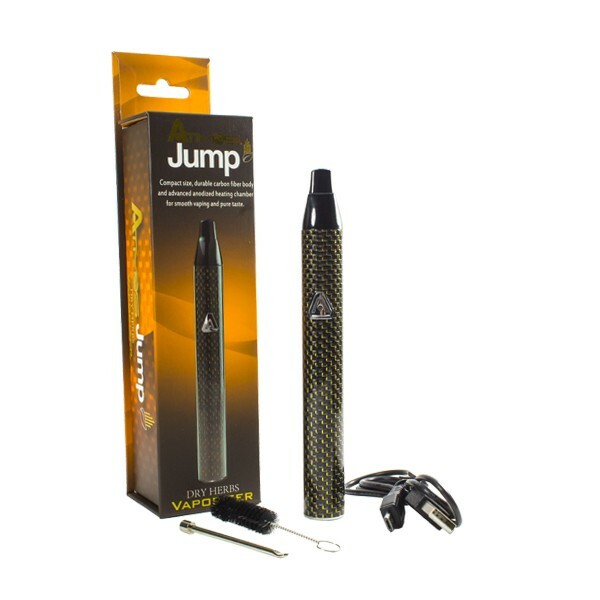 The Atmos Jump combines the incredible portability of a small vape pen with the effectiveness of a much larger vaporizer. That is largely due to the vape pen’s design, which protects your dry flower from the heating coils and allows more thorough heating without burning. An optimized single temperature also protects your dry herbs from combusting, while single button functionality simplifies use. The post The Best Vape Pens for Beginners appeared first on Medical Marijuana, Inc..
How to Fly with Cannabis in the State of California ? April 4, 2018 Comments Off on How to Fly with Cannabis in the State of California ?